The day was held as a mark of appreciation for the senior members who have loyally contributed to the credit union over the years. Seniors at the NIS Golden Years Wellness Centre also took part in the fun day, which was held at their centre at Black Point. The men and women ranging in age from 60 to 90 years old took part in exercises and games led by personnel from the Department of Sports in the Ministry of National Mobilisation. 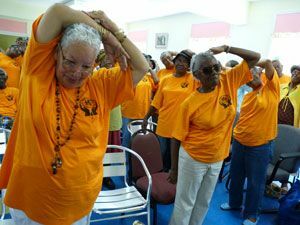 The exercises included simple stretches and aerobics aimed at keeping the elders fit, and games that had most seniors laughing with excitement. They were also treated to healthy snacks while at the centre. Searchlight spoke with a few seniors who all agreed that not only was the event well, planned, but they enjoyed themselves thoroughly. Elma Dougan of Ribishi who would normally have been at home that day making pepper sauce, said she probably would have probably fallen asleep or done some reading after leaving the kitchen. However, she considered the day well spent as she took part in several of the games and interacted with her friends, some of whom she made during the day. The fun day was organized by the Social Development and Education Committees of GECCU.